This article is about the municipality in Rogaland, Norway. For the village in this municipality, see Randaberg (village). Randaberg is a municipality in Rogaland county, Norway. It is located in the traditional district of Jæren, at the northern end of the Stavanger Peninsula. The administrative centre of the municipality is the village of Randaberg. Randaberg is located just north of the city of Stavanger. It is the northernmost conurbation of the Stavanger/Sandnes area, one of the largest urban areas in the country. The Byfjord Tunnel connects the island municipalities of Rennesøy and Finnøy to the mainland of Randaberg. The proposed Rogfast tunnel is to be built from Randaberg, under the Boknafjorden, to the north side of the fjord as well as the island of Kvitsøy. The 25-square-kilometre (9.7 sq mi) municipality is the 415th largest by area out of the 422 municipalities in Norway. Randaberg is the 107th most populous municipality in Norway with a population of 10,873. The municipality's population density is 451 inhabitants per square kilometre (1,170/sq mi) and its population has increased by 14.4% over the last decade. 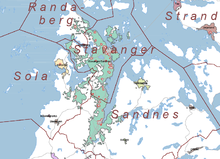 The parish of Randaberg was established on 1 July 1922 when it was separated from the large municipality of Hetland. Initially, there were 1,256 residents of the new municipality. The municipal borders have not changed since that time. The municipality (originally the parish) is named after the old Randaberg farm (Old Norse: Randaberg), since the first Randaberg Church was built there. The first element is the plural genitive case of rönd which means "edge", "brink", or "verge" and the last element is berg which means "mountain" ; however, the meaning of berg could also be "rock", or "cliff". Before the early 1900s, the area was known as Randeberg. The coat-of-arms is from modern times; they were granted on 26 June 1981. The arms show fourteen silver/white coins on a blue field. The arms are partly canting since the name is derived from rond which means "edge" and the coins are placed around edge of the shield. The coins symbolize the ball-shaped stones found in large amounts on the beach in Randaberg. The Church of Norway has one parish (sokn) within the municipality of Randaberg. It is part of the Tungenes deanery in the Diocese of Stavanger. Randaberg is still an active agricultural community, and produces over 80% of Norway's parsley. About 3/5 of the land is arable, and about 2% of the inhabitants are engaged in agriculture. Dairy production, chickens, and pigs are important industries. Only Klepp municipality surpasses Randaberg and has more agricultural production in Rogaland county. The first potatoes every year are grown here in Randaberg and are given to the Royal Family of Norway. However, due to its close proximity to the large city of Stavanger, the area is becoming more urban. There are three main suburbs of Stavanger where most of Randaberg's residents live: Randaberg sentrum (310 houses), Viste/Goa (315 houses), and Grødem (135 houses). Some of the first inhabitants of Norway settled here, and it is believed that the first people came here around 12,000 years ago. It is thought that Svarthola (local name: Vistehålå) was the main shelter for a group of 25 persons, from around 6000 BC. These people were mainly gatherers and hunters, but from around 4000 BC they also started farming. From around 2000 BC, their main activity was farming. All municipalities in Norway, including Randaberg, are responsible for primary education (through 10th grade), outpatient health services, senior citizen services, unemployment and other social services, zoning, economic development, and municipal roads. The municipality is governed by a municipal council of elected representatives, which in turn elect a mayor. During the summer the beaches here are very popular, and among the finest in the area around Stavanger. This includes Sandestraen and Vistestraen. Hålandsvannet, a small lake, is also a popular place for swimming. ^ Statistisk sentralbyrå (2017). "Table: 06913: Population 1 January and population changes during the calendar year (M)" (in Norwegian). Retrieved 2017-11-01. ^ Rygh, Oluf (1915). Norske gaardnavne: Stavanger amt (in Norwegian) (10 ed.). Kristiania, Norge: W. C. Fabritius & sønners bogtrikkeri. p. 206. ^ "Civic heraldry of Norway - Norske Kommunevåpen". Heraldry of the World. Retrieved 2016-05-10. This page was last edited on 6 January 2018, at 21:41 (UTC).